If you aren’t ready to commit to a vegetarian or vegan diet full time, consider opting for a meat-free meal once each week, which can save 84,000 gallons of water per year. This is not my typical Meatless Monday post but I think it’s worth sharing. I am against energy drinks (for my own personal reasons) but I have often wondered about the likes of sports drinks. Especially when comparing the price of Pedialyte and Gatorade…….what’s the big difference? When I came across this article I thought it was a great read for parents. The major difference between energy drinks and sports drinks is Caffeine content! Both have tons of sugar but because of caffeine levels, energy drinks can be dangerous for teens and younger children. The amount of caffeine in energy drinks can be 3 to 4 times as much as a large can of soda. Sports drinks don’t contain caffeine but do contain electrolytes. Electrolytes are used by our cells to maintain electrical impulses. When electrolytes are lost during vigorous exercise they can be replaced by those in sports drinks, thereby restoring balance to your body’s systems. However, sports drinks weren’t intended for teens after an hour of basketball practice, but for athletes doing intense exercise for an hour or more. According to the article, children and teens should rehydrate with water. And in the case of a sick child, with less sugar and more electrolytes, Pedialyte is still the best option. So the take home message is that energy drinks are no-no for kids, sports drinks should be limited and water is always the best bet. Here are some fun facts about our Meatless Monday veggie of the day, Broccoli. Broccoli is one of the healthiest green vegetables. It’s versatile, inexpensive and tastes great. Broccoli, Cauliflower, Cabbage, Brussel Sprouts, and Kale are all of the exact same species of plant! Many folks don’t believe this as they look so different…. but how does a Poodle compare to a Great Dane? The name “broccoli” comes for the Latin word brachium, which means “branch,” or “arm.” Broccoli has only been grown in America for about 200 years and for much of that time it was considered exotic. Until the 1920’s, broccoli was virtually unknown by most Americans. Broccoli production in the U.S. increased 700% between 1971 and 1991 and is continuing today. Broccoli is a “cool weather” crop and does poorly in hot weather. Because it is tolerant to cold, it is available year ’round in the U.S. The American film producer, Albert R. Broccoli, (April 5, 1909 – June 27, 1996) famous for producing the James Bond movies, claimed his family invented Broccoli. This has been judged a highly dubious claim by most experts. Broccoli comes in a variety of colors, ranging from deep sage all the way to dark green and purplish-green. Tom “Broccoli” Landers holds the current world record for eating 1 pound of broccoli in 92 seconds. Today we continue the “Easy ways to eat more veggies (and fruits)” series. 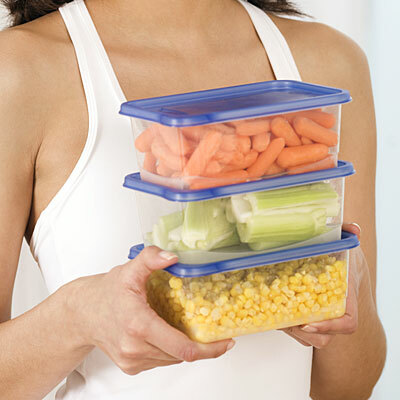 So for the next few Meatless Monday’s we’ll give you tips on how to get move veggies into your busy lifestyle. Serve main dish salads. No explanation needed. But as a side note if you have kids consider having a salad bar at home and allow them to add their own ingredients or eat them as piles of separate foods. 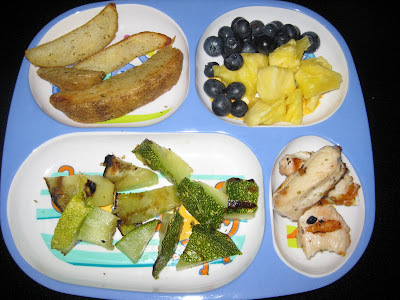 Today continues the “Easy ways to eat more veggies (and fruits)” series. So for the next few Meatless Monday’s we’ll give you tips on how to get move veggies into your busy lifestyle. Today starts a new series on “Easy ways to eat more veggies (and fruits)”. So for the next few Meatless Monday’s we’ll give you tips on how to get move veggies into your busy lifestyle. Prep ahead. This one is key: Make sure your fridge is stocked with ready-to-eat veggies. Whether this means cutting carrot sticks by the bag-full or buying baby carrots, do what it takes. Celery, carrots, bell peppers, cucumbers, and sugar snap peas are some of our favorite fresh vegetables. Another tip is to put the veggies out so you can see them, use clear containers in the fridge or place them on the counter so they’re in eye-sight. Have your favorites ready so when you’re hungry, you grab them. I also find its easier if I wash grapes and cut melons so that I have a healthy snack when I’m on the go or waiting for dinner.